HMD Global, which holds the rights for Nokia brand, will launch a new version of Nokia 105 model priced at Rs 999 as it looks to tap the feature phone market in the country. The dual SIM version of the device will be priced at Rs 1,149 (excluding taxes and subsidies). Both devices will hit the stores on Wednesday. 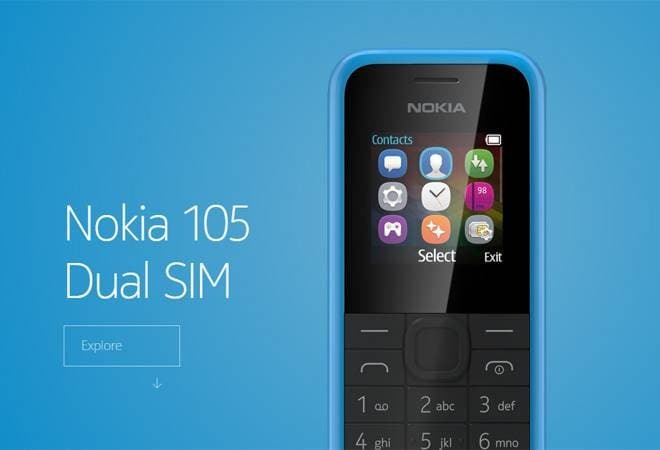 Besides, the company will also launch another feature phone, Nokia 130, in India in the coming weeks. "With more than four billion people remaining offline and unable to benefit from the social and economic development opportunities of the Internet, simply getting connected by voice and text is still such an important step for many people around the world," HMD Global CEO Arto Nummela said in a statement. He added that more than 400 million feature phones were sold globally in 2016. It is estimated that there are over 1.3 billion feature phone users across the world, mainly in markets like Asia and Africa. "We cannot underestimate the need and benefit of being connected and we are dedicated to delivering devices that can enable many people around the world to expand their horizon," he said. While smartphone sales in India have grown at a massive pace, feature phones continue to account for more than half of the mobile phone sales in the country. According to research firm IDC, feature phone shipments stood at 29.7 million units compared to 27 million smartphones during the January-March 2017 quarter. HMD has said it will include both feature and smartphones in its portfolio as it attempts to make a comeback into the global mobile phone market that is dominated by the likes of Samsung, Apple and Huawei. Nokia 105, in its previous avatar, sold well over 200 million units. The revamped version of the Nokia 105 features a new ergonomic design, better battery life, a larger screen size and new tactile island keymat, HMD said. Both models feature 1.8-inch colour screens and LED torch lights. The Nokia 130 is expected to be priced under Rs 1,500 and is likely to be launched in India around September.